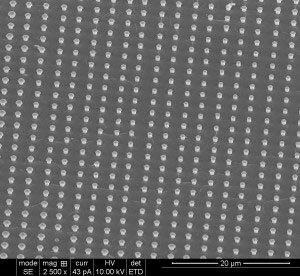 (Nanowerk News) A researcher from Missouri University of Science and Technology has developed a new way to grow nanowire arrays with a determined diameter, length and uniform consistency. This approach to growing nanomaterials will improve the efficiency of various devices including solar cells and fuel cells. These semiconducting nanowires could also replace thin films that cover today’s solar panels. Current panels can process only 20 percent of the solar energy they take in. By applying the nanowires, the surface area of the panels would increase and allow more efficient solar energy capture and conversion. The wires could also be applied in the biomedical field to maximize heat production in hyperthermia treatment of cancer. In fuel cells, these nanowire arrays can be used to lower production expenses by relying on more cost-efficient catalysts. “My team and I hope to replace or outperform the current use of platinum and show that these nanowire arrays are better catalysts for the oxygen reduction reactions in the cells,” says Dr. Manashi Nath, assistant professor of chemistry at Missouri S&T. The nanowires, which are grown on patterned nanoelectrodes, are visible only through an electron microscope. Nath creates the nanowire arrays through a process that she calls confined electrodeposition on lithographically patterned nanoelectrodes. To grow the nanowires, Nath writes an image file that creates a pattern for the shape and size she wants to produce. Using electron beam lithography, she then “stamps” the pattern onto a polymer matrix and the nanowires are grown by applying electric current through electrodeposition. Nath grows the nanowires in a parallel pattern, which resembles a series of nails protruding from a piece of lumber. One end is held secure to a metal conductor like copper or gold, while the other end spikes outward. The entire structure is surrounded by a polymer matrix. Nath and her research team can produce wires of any shape or size. To increase the nanowires’ surface area, Nath can make them hollow in the middle, much like carbon nanotubes found in optics and electronics. The nanowires allow current to travel through them. The polymer, which is nonconductive, can be removed to allow the wires to stand freely and yet not lose shape or consistency. Currently, the wires are made from the metal chalcogenides, which includes cadmium telluride, cobalt selenide or iron selenide. With funding from the American Chemical Society, Nath is working to improve the practical effectiveness of various types of fuel cells by simplifying the oxygen reduction reaction.